What should I put in my Destination Wedding welcome bag? A welcome or thank you letter to your guests would make them feel special for making the trip to your destination wedding. Think about creating one general message that you can type up and print out to include in each bag. To make things easier on yourself and your guests you can provide them with designated key contacts to help if any issues or questions arise. Include a contact for the resort, a wedding planner contact, and a few family member contacts that can help answer general wedding related questions. By providing key contacts for your guests, this will keep your guests from reaching out to you for information. It will be very helpful for your guests to have a printed copy of the upcoming wedding events. This will help answer questions about where your guests need to be and at what times. You may also include additional general details such as expected weather and the dress code for each event. If your guests are unfamiliar with the destination, you may consider including information about local tours and activities that could keep them busy during their free time. You can either create a list for them or request brochures directly from the hotel that you can add to your welcome bags. If you are working with a destination wedding travel agent, they can help you and your guests arrange tours and activities in advance. Transporting snacks to your destination, especially in bulk, may be difficult, so you may consider visiting local stores to purchase snacks. Consider local candies, cookies, or popular packaged foods from that particular destination. While many of your guests may have already packed everything needed for their vacation, it may be a nice gesture to include a few items you believe they will need during their trip. For example, a travel sized sunscreen, Tylenol, tissues, or mints. January 10, 2019. -- Modern Romance Travel was announced a winner of the renowned WeddingWire Couples’ Choice Awards®. 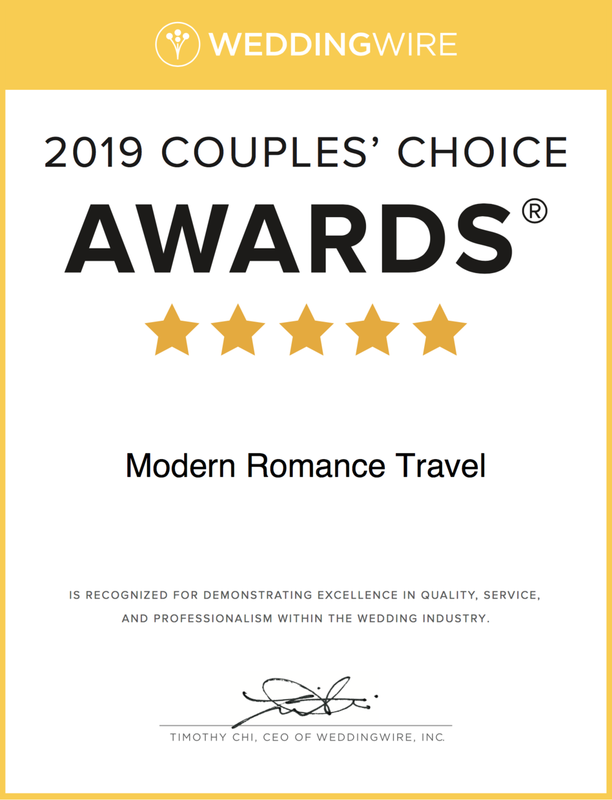 Modern Romance Travel received this esteemed award based on their outstanding experience working with real newlyweds. WeddingWire features more than three million reviews, and these notable vendors all received prompt, reliable, and quality feedback. "We are celebrating our 11th annual Couples’ Choice Awards, where we honor our vendors who help make millions of couples’ big day one to remember," said Timothy Chi, CEO, WeddingWire. "Not only are these hard- working and distinguished wedding professionals, such as Modern Romance Travel, a fundamental part of the wedding planning process for engaged couples, but they help make WeddingWire a trusted source for wedding planning. We congratulate everyone on this well-deserved achievement." Modern Romance Travel is honored to be one of the top wedding businesses in San Ramon on WeddingWire.com. For more information about Modern Romance Travel, please visit us on WeddingWire. To learn more about the WeddingWire Couples' Choice Awards®, please visit www.weddingwire.com/couples-choice-awards. We have been waiting for months to visit this hotel! Hotel Xcaret is a destination nestled amongst the lush jungle and the white sands of Riviera Maya. It revolves around luxury, Mexican culture, and the seven archaeological parks and tours that are a part of the Experiencias Xcaret family (which are all included in your stay). The architects and developers spent nine years researching and developing what this property would come to be. The Architecture surprised me by its mixture of modernism and tradition. The hotel even has its own underground cenotes. The property captures the true essence of Mexican culture! Hotel Xcaret has something that is truly unique when it comes to destination weddings. The venues are some of the most stunning we have ever seen. We are so excited to help couples plan their weddings here! We fell in love with Hotel Xcaret’s luxurious amenities in a natural paradise. There is something for everyone at Hotel Xcaret. Check out a short video that we captured during our latest stay. During our last visit to Los Cabos, we had the opportunity to visit Flora Farms. It is located in the new Puerto Los Cabos area about 15 minutes away from San Jose del Cabo. Flora Farms is like a luxury culinary theme park. The magnificent ten-acre farm and field kitchen restaurant is a perfect blend of laid back Baja and Sophisticated California. The architecture, décor, design, and plating of the food makes Flora Farms Instagram worthy. Once you step into the farm, there is something for everyone, especially food lovers. We were lucky enough to do the guided tour prior to dinner and it has become one of our new favorites and Must do’s in all of Mexico! The menu changes with the seasons. The farm is perfect for families, couples and events. The set-up of the farm and its venue spaces makes hosting a wedding rehearsal dinner or farewell brunch a breeze. Flora Farms is one of those places that you will want to forever revisit. 10 Reasons Why Destination Weddings Are The Best! 10 Reasons Why Destination Wedding Are The Best! Can’t decide whether to planning destination wedding or not? Here are 10 reasons why destination weddings are the best. Give this article a read and we are sure that you will fall in love with destination weddings. The affordability of a destination wedding has many couples speeding off to the airport faster than you can say I do. Couples can get married at an all-inclusive resort and spend on average $15,000. The national average cost of a wedding in the US is $35,329. What should a couple do if her family is from the East Coast and his family is from the West Coast and the couple lives in Seattle? They meet on neutral grounds. Destination weddings are the great geographical equalizer because they take place in a neutral spot. Since the destination is largely new to everybody, your big day will be equally exciting to your guests as it is for you. There are more than two million Americans who get married every year. One in 25% is a destination wedding. If you choose a destination wedding you won’t have to choose the same hometown venues all of your friends and family have booked. Once you arrive at your destination you will already be in a relaxed mood as all of the wedding events begin. Many of the resorts offer honeymoon upgrades and special perks to the couple on their wedding night. Planning your big day considerable miles away from your living place sounds like stressful. But trust us, it's not so. Leave the details to your destination wedding specialist and on site wedding coordinators. They are familiar with all the wedding packages, and take care of all of the ceremony and reception essentials. All you have to do is bring your dress. Destination Weddings have less obligatory invites and more MUST have loved ones. Friends and family who “make the cut “often know that the list was limited and they love feeling important to the couple. If you choose a venue with a stunning backdrop, you won’t need to break the bank trying to cover it up with expensive flowers and décor. Nearly all destination weddings take advantage of their setting’s natural beauty. A destination wedding allows you to get creative. You can have a traditional wedding, cultural wedding, or even a religious wedding and customize it so it reflects your personal style. Even if you choose to have a traditional wedding, a destination wedding will be unlike any other wedding. Your wedding album also should be unique as your wedding. Because it will be a lifetime memory for you, reminding some of the most special moments of your life. In a local wedding, your photos will be taken in the usual places that you see every day. But, open the options to say, the Riviera Maya, and you’ve got the makings of some epic shots. The standard wedding at home lasts for 5 hours and the couple is running from table to table, trying to say hello to everyone. A destination weddings spans to a minimum of three days- which means you actually get to spend quality time with your closet family and friends.